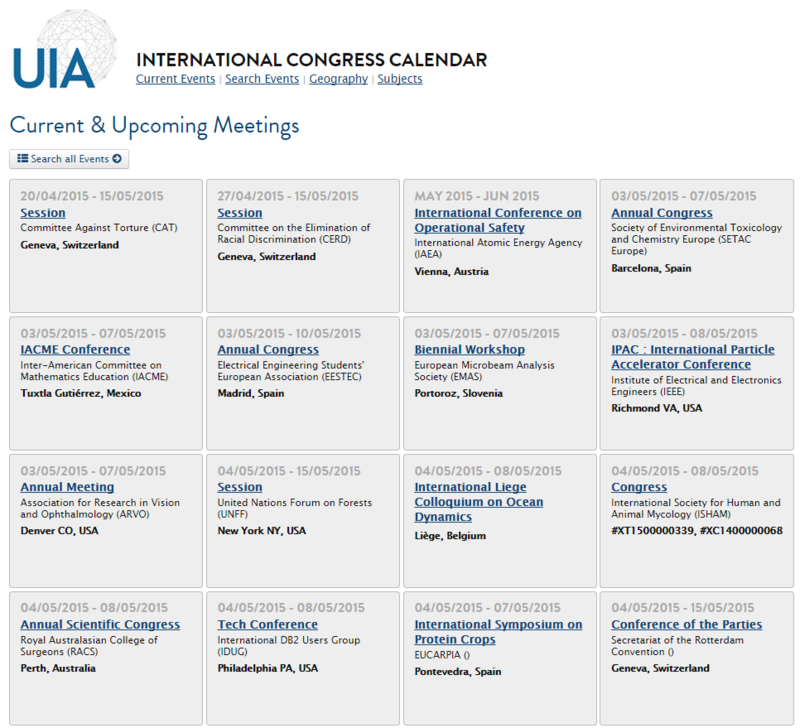 The International Congress Calendar includes over (or c.) 485,000 meetings and events organized or sponsored by Intergovernmental Organizations (IGOs) and International Nongovernmental Organizations (INGOs) working worldwide. The Calendar covers meetings from 1851 to 2030, over 3,000 of which are future meetings. Also included are national meetings with a large international participation. Information on all meetings is edited by an editorial staff and presented in a standardized format to facilitate comparison and statistical analysis. The meetings data compiled by the UIA is analyzed in great detail in its Annual International Meetings Statistics Report . If your research needs and information requirements extend beyond the capabilities of the Calendar, please see our customized solutions. All prices listed are without VAT. Please note that for customers in Belgium and for EU customers that do not have a valid VAT number, the price will be increased by VAT according to Belgian law. An IGO is an organization composed primarily of sovereign states, or of other intergovernmental organizations. IGOs are established by treaty or other agreement that acts as a charter creating the group. Examples include the United Nations, the World Bank, or the European Union. The United Nations Economic and Social Council (ECOSOC) defines an INGO as "any organization which is not established by inter-governmental agreement" (Resolution 288 (X) the 27th February 1950), "including organizations which accept members designated by government authorities, provided that such membership does not interfere with the free expression of views of the organizations" (Resolution 1296 (XLV) of 25th June 1968). Provides a quick glance at 100 current and upcoming meetings listed in the database. Profiles of over (or c.) 485,000 events, over 3,000 of which are future international meetings, organized or sponsored by international non-profit organizations and associations working worldwide. The database covers meetings from 1851 to 2030. Find meetings, using a drill down method, by the world region, country and city in which the event takes place. Find meetings by subject of activity of the organizing association, using a drill down method based on UIA's Subject Matrix. 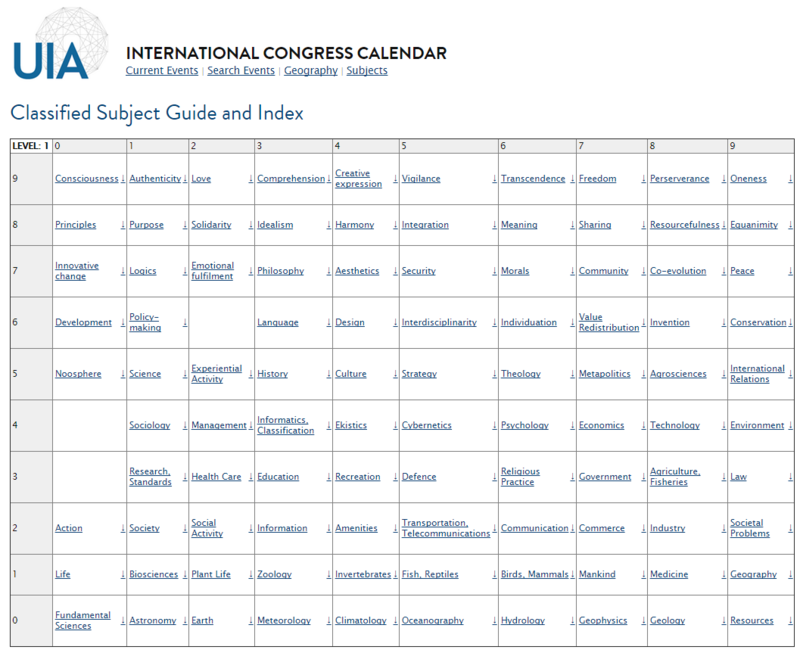 The International Congress Calendar was published in PDF from 2005 to 2017. For more information, please contact us. Associations listed in the Yearbook of International Organizations may be eligible for up to a 25% discount on the International Congress Calendar. Subscription agents receive a 15% discount. Accepted payment methods for online orders include PayPal, credit card or bank transfer. You may also request an invoice. The subject index groups together international organizations which have similar concerns. The subject index is based on words taken directly from the titles and profiles of international organizations. (*) The words are classified into subject categories and sub-categories. It is possible to search the index using individual words, subject categories, and sub-categories. There are 100 subject categories. They are structured into a matrix of ten rows by ten columns, resulting in 100 cells. Each of these 100 cells represents a subject category and is titled accordingly. For example, cell "06" (row 0, column 6) is titled "Hydrology", while cell "60" (row 6, column 0) is titled "Development". Each cell is futher divided into at most ten sub-cells. For example, the "Hydrology" cell is divided into three: "Hydrology", "Rivers and Lakes", and "Water". The "Development" cell is divided into nine: "Aid", "Assistance", "Development", "Empowerment", "Help", "Potential", "Progress", "Reform", and "Sustainable Development". Each sub-cell covers an infinite number of words in a multiplicity of languages. These are the words taken directly from the titles and profiles of international organizations. For example, the sub-cell "Rivers and Lakes" covers, at the moment, 50 words, including: "inland waters", "pond", "tributaries", "fleuves", "ozera" and "ríos". The sub-cell "Sustainable Development" covers, at the moment, 39 words, including: "renewable", "sustainability", "unsustainably", "soutenable", "sostenibilidad", and "nachhaltige". You can search the subject index by an individual word by typing the word into the search box. Your results will be all the organizations containing(*) a word classified under the same (sub-)category as the word you requested. For example, if you search for "tributaries", your results will be all the organizations containing(*) one or more of the words classified under "Rivers and Lakes". If you search for "sostenibilidad", your results will be all the organizations containing(*) one or more of the words classified under "Sustainable Development". You can search the index by subject category or by sub-category. We recommend you start such a search by clicking a cell in the matrix. Your results will be all the organizations containing(*) a word classified under the (sub-)category you have selected. For example, if you select the category "Development", your results will be all the organizations containing(*) one or more of the words classified under the category "Development" and its sub-categories. If you select the sub-category "Sustainable Development", your results will be all the organizations containing(*) one or more of the words classified under the sub-category "Sustainable Development". (*) The words used for the subject index are the words in the titles of organizations (in all languages), and selected keywords marked in the paragraph "Aims". What are the sources of information in the Calendar? 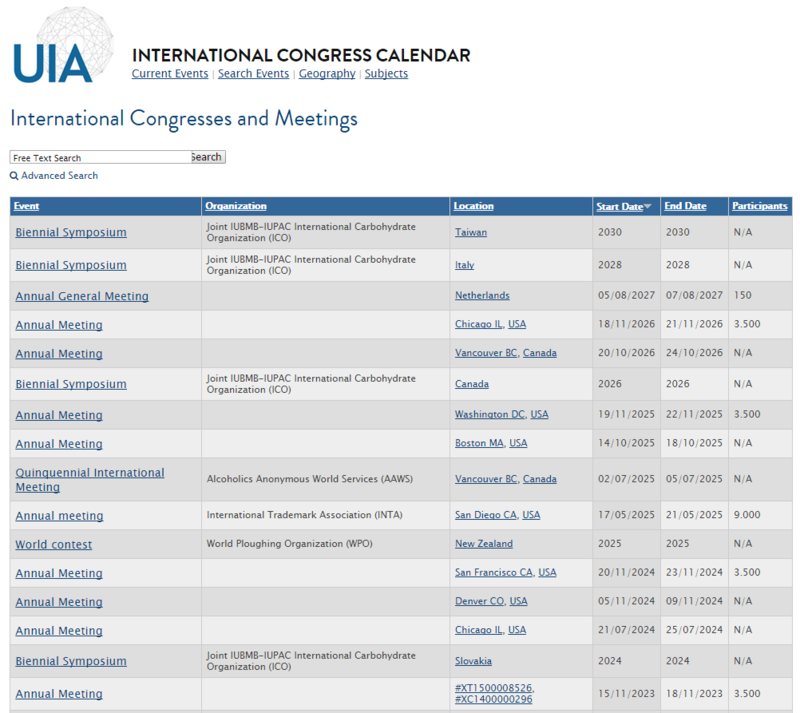 Compiling information for the International Congress Calendar involves a year-round process of research and editing. Proofs of organization descriptions which include meetings entries are sent out by post, email and fax for the organizations themselves to correct. The average response rate is 35%, ensuring highly reliable information. Priority is normally given to information received from the organizations themselves, and every effort is made by the editors to check this information against other sources. Proofs are supplemented with information from websites, annual reports, newsletters and other documents. What information do Calendar event profiles contain? The meetings profiled are the key regional and multi-continental meetings of Intergovernmental Organizations (IGOs) and International Nongovernmental Organizations (INGOs) worldwide. Also included are national meetings with a large international participation. Are there other resources on meetings in addition to the Calendar? The meetings data compiled by the UIA is analyzed in great detail in an extensive annual report ( International Meetings Statistics ) provided to UIA Associate Members as part of their subscription. This statistical review is also available to the general public three months after it has been released to the Associate Members. How can I contribute information?